Rogue Trooper Redux is one of the many indie games that were announced during and / or following the Nintendo Switch Nindie Showcase, back in March. It’s a remaster of the 2006 tactical shooter, based on the Rogue Trooper comic. Rogue is a GI (Genetic Infantryman), and part of an army of bio-engineered soldiers created by Southers, in their all out war against the Nort regime (a colonial one). He’s a pretty deadly soldier, who can not only survive the poisonous surface of Nu Earth unscathed, but also possess enhanced abilities. He’s the only remaining GI standing, after his kind is all but wiped out by a devastating massacred. He carries the consciousnesses of three fallen comrades with him at all times, as biochips implanted in his equipment. Those biochips enhance his powers even further, transforming what was a “mere” super soldier into a full-fledged, autonomous destruction machine. The only thing he cares about: his mission, which consists in taking revenge for his fallen comrades. 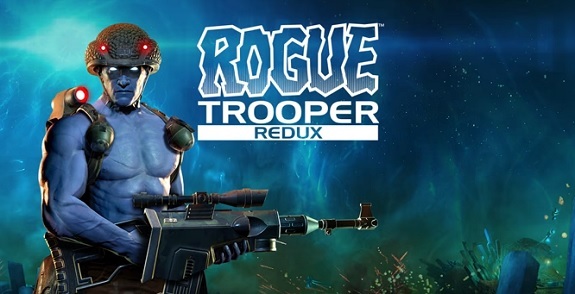 Rogue Trooper Redux (Switch – eShop) will be released later this year in Europe and North America.